So, who wants to buy a smartphone game for a retail price? Well step on up, games fans, because Angry Birds Star Wars is coming to Wii U, Wii and 3DS; tough luck, DS owners. Once again Rovio's iOS and Android phenomenon is being brought to consoles by Activision, with a North American release date set for 29th October and a global release elsewhere on 1st November. Just yesterday the sequel to this title was confirmed for iOS, so it was perhaps inevitable that the original would makes its way to consoles, following on from Angry Birds Trilogy before it. In order to make this retail package appealing, the game's official spiel promises new co-op and competitive multiplayer modes, 20 all-new levels and 25 hours of content. We imagine the title will be particularly well suited to the Wii U, with the GamePad equating to something like its original intended tablet platforms. You can see the trailer below. Is this the fowl side of the Force, or a game worth blasting through on a home console or 3DS? Although I won't touch this (i did get it for free on my phone at the time), it's nice to see Wii support. Is Angry Birds still popular? I mean if they give it away for free now on phones, how do they expect anyone to be willing to pay for it? If this is $40 for 3DS or $60 for Wii U they are out of their minds. $10 on any system is even too much. Should be $1 eshop release, tops. @XCWarrior "If this is $40 for 3DS or $60 for Wii U they are out of their minds." Agreed, that's simply stupid, but IMHO not far from the truth. This game was just FREE, so I wouldn't pay anything for this pile of meh. I don't know who will buy this if its available for free on phones, I like angry birds as a free time killer but I wouldn't pay for it..
WTF? Why won't they just release the games on each platform's respective download store? I just got this for free on my iPhone... lol. These games are ok for time killers, but I'd rather play a real game on a dedicated gaming console. Si they're not even including the second ABSW? That's very lame , Rovio. It's a great game for small sessions, and it would fit perfectly in the e-shop but to buy a cartridge for this forget it. Max price would be 10 dollar. Why because it's a brand. Smart choice would be 5 or 7 dollar. No way it's the first one. Throw it in a garbage can walk away from it and never look back. Yeah, I'm never gonna understand this. I'd definitely get it for, say, $1 on the Wii U e-shop, since it does indeed seem to work very well on the gamepad. Retail price, though? Not in this galaxy. Cool game. Hopefully it will be able to have Angry Birds Star Wars II (which is getting released soon) as DLC. I paid $2.99 for this game on my droid. This game is fun but the console versions of Angry Birds are always way more expensive. @ScorpionMG wii u and other systems have digital services to release this game. I have most of the angry bird games for free. I don't play them much I just like getting free things on the App Store. They are trying to sucker people into buying these games. They probably think because it is in a package and close to full price it adds something. Nothing that merits this price seems added. Free on Android, 69p on iOS and they'll want £40 approx. for it? @Platypus101 not sure he actually said it, but Nintendo never holds any grudges. Grudges are bad for business. I don't think this is meant to be personally purchased. When a kid gives a harried working mother a list of 10 videogames he wants for Christmas and nine of them cost $60 and are FPS and this 1 costs $40 and is world famous the kid is getting this one in his stocking. AB Trillogy gave "Hundreds" of hours. Why does this one only give 25? 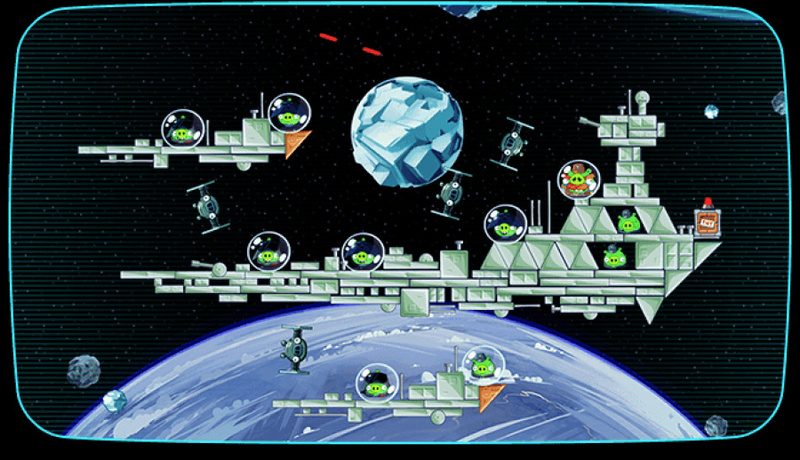 Also, why not box Angry Birds Space? That game is more fun. @Kyloctopus - "Also, why not box Angry Birds Space? That game is more fun." B/c some people will buy a turd if it's shaped like R2D2 and a smelly old sneaker if it plays the Star Wars theme music. If you watch that video and somehow just came out of a coma and didn't know anything whatsoever about Angry Birds you would still buy that game for $40 if you were a big Star Wars fan. And considering there are people in the world who write Jedi as their religion we know there are a few of those. I have a very deep dislike for Angry Birds. I honestly think it's insulting that they take a smartphone game which is 99 cents at the most and then charge 30 bucks for it. I like Star Wars,and I don't mind Angry Birds,but I ain't paying £40 for this. Just makes these eShop games at cheap prices. You'll turn up more profit that way! make it a 3d angry birds and then maybe i will buy it. This isn't even worth the 99 cents on iOS. Why would I want a $60 (plus tax) console version? Retail game, seriously? Should have been introduced as digital only. I would have considered buying it for like, $4 or $5 because my phone and tablet are both too slow for me to enjoy playing it on them. This sort of **** really makes me hate Rovio and Activison. Oh and Disney because they own Star Wars now. Yes! Now I can play Angry Birds on my Vita! yeah $40 is pretty steep considering even with all the purchases in game it's probably not that much. It better have ALL that buyable stuff included for that much. Also it's silly to sell retail like that, totally backwards thinking; it's inherently a mobile experience just leave it as DL only. Seems like people are super mad here about it, though, even people who have never played it. Play it for an hour or so and you'll see why people like it, it's not the devil. It's great for the same reason Nintendo games are great; the control and playabilty are extremely solid while simple and accesible and the content is harmless. Isn't this the backbone of a big successful Nintendo game? I sense some sour grapes here about mobile platforms, since this is the game/franchise that strangely but single-handedly made mobile a contender in the games market. If you're bitter don't play them, but don't dismiss this kiddy stuff entirely as there was a time when you were in jammies frothing for a stupid simple game that people thought was a fad too (super mario brothers/duck hunt) the platform is new, the approach/market is not. I would only buy this and Trilogy if they came to the eShop, under an extreme discount. Why don't they just be Eshop releases! That would perfect! Exactly! Why not wait for the sequel, and make another trilogy? The price is outrageous. Angry birds isn't even well suited for a home console. Angry Birds is a good iPhone game and exactly that. It's not worth $50 in any sense, it's worth the apple store price. People who buy this need help. Why not just an eShop release. Something like this is just not suited to retail. according to vgchartz angry bird trilogy sold and 0.36M in the 3DS, this means more than 300 thousand people were willing to pay full retail price for a free cell phone game... would like to meet just one of those and ask them why? I don't get the hype for Angry Birds. I don't get the hate on Angry Birds. I also don't get why someone would pay this much for Angry Birds. Anyway, as many others have said, this would be perfect for an eShop release. That is, just as long as the price tag would be about 1/10 of what it is now. @C-Olimar Exactly what I was thinking. The Wii U has a new killer app! I'd buy it if it was on the eshop and lower than 5 dollars. Well, that's my rage for the day. @Kaizokuman I sort of, very, very, very slightly understood Trilogy as a retail title. Having one cheap throwaway time wasting game on its own baffles me. Plus the reduction of content - 300 hours down to 25. Why is this game so much? I will have to wait to see how well is plays on the 3DS before I consider getting it. @dumedum I got that grudges are bad for business, but this was said within the last month prior to their planned release on Wii U... Article posted here on NL. It's not the grudge that I want to enforce, it's that the Wii U does not need any more bad press from developers/publishers. Also, I see the developer/publisher has no qualms about getting the 10x multiplier on his profits! So no, no grudge, just a boycott.